Comment by David Theodoropolis, JLH Seedsman: Borassus flabellifera. The palm is tapped for a sweet, sugary juice ("ras") which is drunk fresh or fermented into an intoxicating beverage ("toddy"), or distilled into palm wine ("arak") or boiled down into a sugar ("jaggery"). Each palm gives 4 quarts of juice a day for 5 months of the year, for 50 years. Anyway, the use of arak caused so much drunkenness and disturbance that the Brits destroyed the palms in some areas, and back as far as 1673 visitors noted a "perpetual disturbance of the peace" because of this, and areas with lots of palms being "overrun with soldiers and seamen of the Moors." 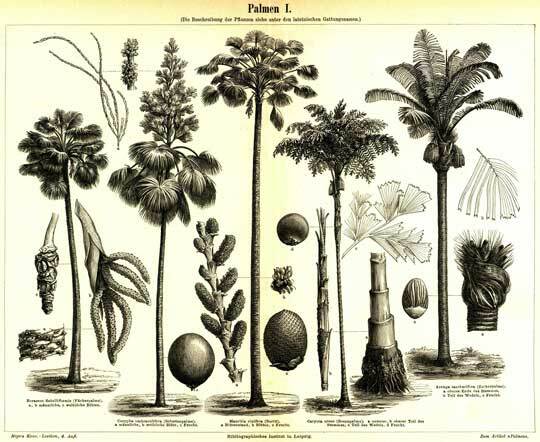 The palm has many food uses, fiber for weaving, and medicinal uses, timber, etc., so is a valuable palm. So the planting of the palm can result in future consequences, good or bad, that might persist for 50 years. So maybe that has something to do with the simile. Food, weaving, basket-making, drunkenness, medicine, they are all there in the seed of the palm.